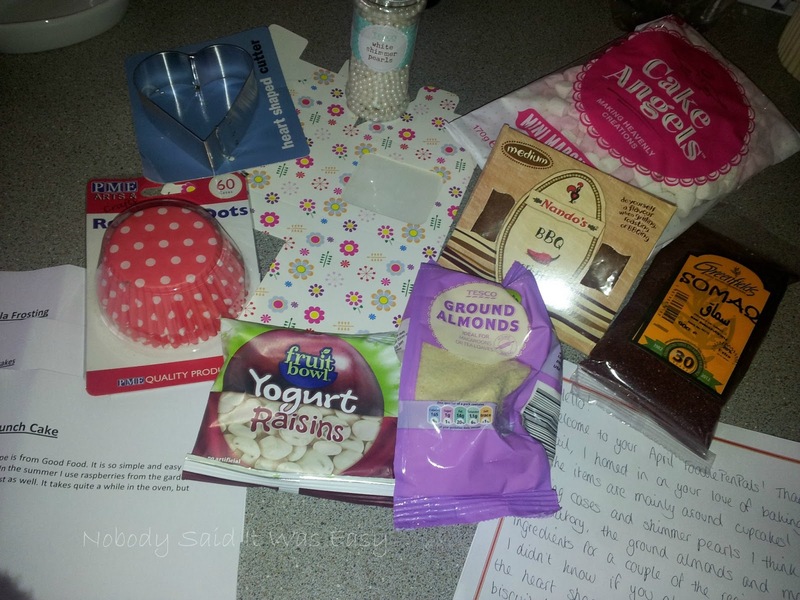 This month my penpal was the lovely fellow baking addict Rachel over at Jaques, it rhymes with cakes (I love the blog name!). I was delighted to open my parcel, once again filled with baking goodies! There were a couple of savoury bits in there too but will go into a little more detail further down. First thing I noticed were some recipe sheets, all sweet things! 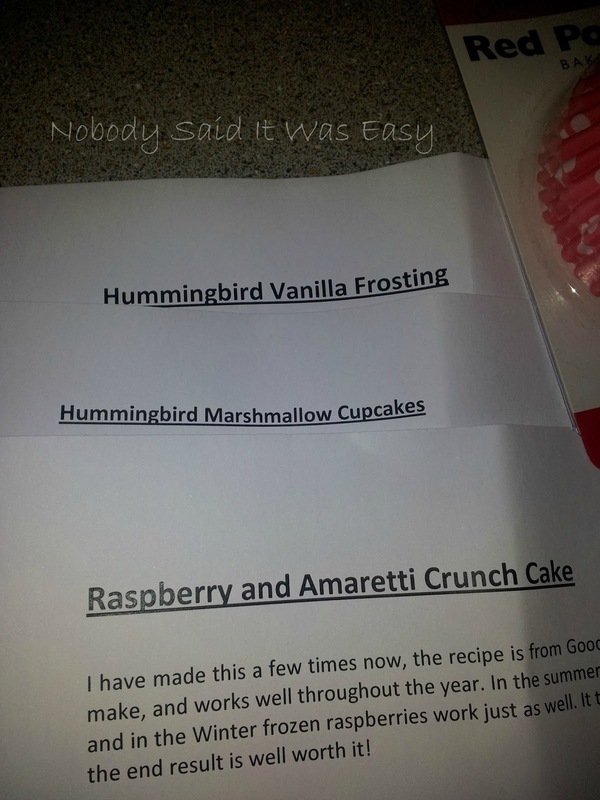 One of these was for marshmallow cupcakes from the Hummingbird Bakery Book – now I thought I had this one, but I don’t – it’s Cake Days which I have, so no wonder I didn’t remember coming across it! Of course I know the vanilla frosting one though, one of the other recipes! There was also one for raspberry & amaretti crunch cake – now this sounds delicious! I think it might have to be my first bake after this week’s challenge is over! 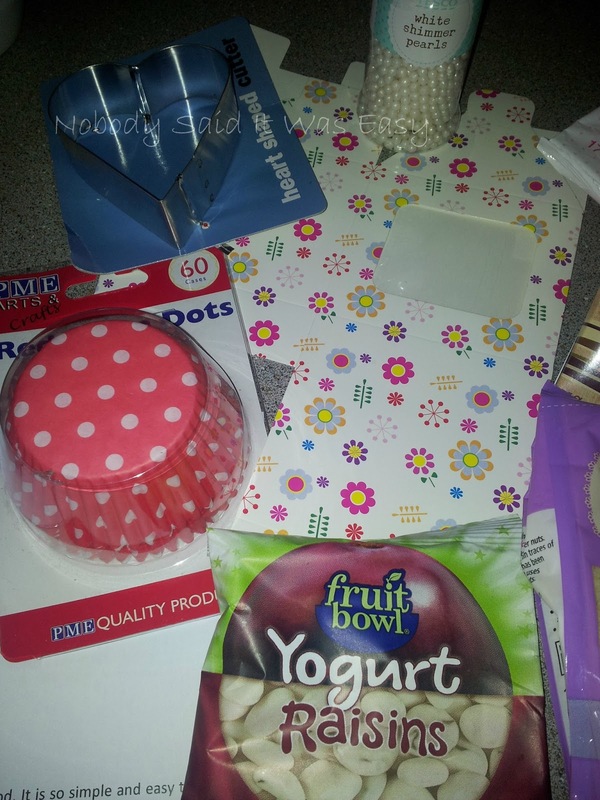 So for the baking related stuff – first up some cupcake cases – you can never have too many cupcake cases! And I didn’t actually have these ones, so they were perfect. Also a single cupcake box – she sent this as she thought a single cupcake gift was a lovely idea – indeed it is, now I have to find someone special to use it for! (Teehee). A heart shaped biscuit cutter – these are great too; another thing which I have many of, but not a heart shaped one! Now for the edible sweet things – some pearl decorations – once again, you can never have too many cake decorations! (In actual fact, can you ever have too much of anything cake related?!). Some yogurt raisins – these are for the little man to enjoy whilst I’m eating a yummy creation, very thoughtful of Rachel! A big pack of marshmallows – these were obviously for the marshmallow cupcakes! Now, I did attempt these, but I think I must have done something wrong, as they looked nothing like Rachel’s over on her blog! They were still yummy though – apart from the rock hard melted marshmallow – think I need to attempt that one again… Some ground almonds – these are for the crunch cake (my mouth is watering just thinking about even making it!). And then for the couple of savoury bits – some Nando’s BBQ chicken seasoning – to go with my love of spice. Can’t wait to try this, think it will be nice on some chicken in a deli wrap, with some salad. And some somaq spice – I’ve never heard of this before, but Rachel says it is nice sprinkled in casserole, so I will have to be trying that. 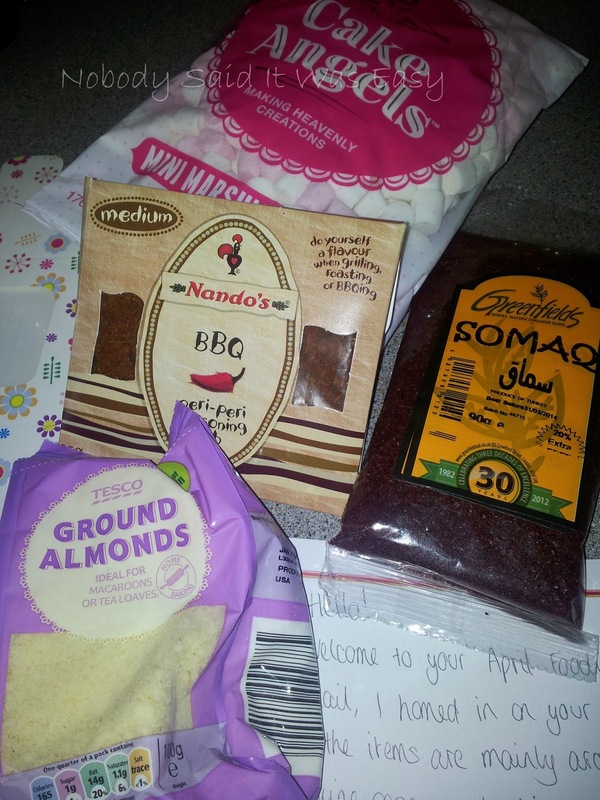 Thank you to Rachel for another great foodie penpals parcel!